If you need a printer to keep up with your workgroup, then Xerox has the perfect laser printer for you. 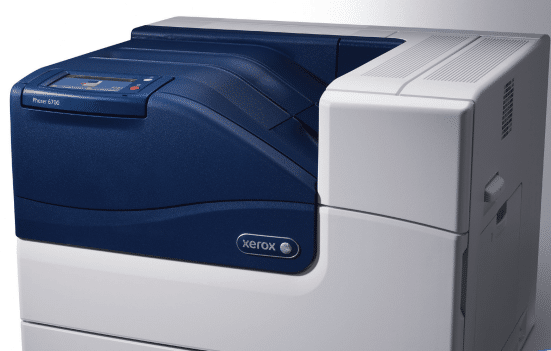 The Xerox Phaser 6700 is designed for today’s busiest workgroups, and can quickly tackle whatever job you may have. The exceptional image quality created by the Phaser 6700 will impress all your businesses contacts. This full color printer offers outstanding color quality with 2400 x 1200 dpi. Images will come off brilliant every time, with speed to match the busiest office environments. Print speeds reach up to 47 prints per minutes, while guaranteeing consistent, quality images. The Xerox Phaser 6700 aims to keep your groups working longer, without interruption. It offers a 2900 paper holding capacity, and high-capacity toner cartridges to make sure you can work longer. Additionally, the Phaser 6700 is capable of 120,000 monthly prints, allowing even the busiest offices to finish the jobs they need done. The Phaser 6700 was also made with sustainability in mind. The consumables are made for extra-long life expectancy so you need to make fewer changes. It has also won ECOSTAR awards for energy saving. With the Xerox Phaser 6700 in your office, there is no print job that you cannot tackle. Xerox’s history of superiority printers make them the industry standard when it comes to print and copy solution. Call Laser Printer Center to find out if the Xerox Phaser 6700 is right for your office!